This was on my bed in the hotel upon arrival. Is this only for Canadians?? A funny thing happened on the way to my fishing trip 🙂 … I ended up in Salt Lake City this weekend. I can’t say it was spontaneous because Refnaf & I vowed to be at David’s first concert, wherever that was. In fact we actually thought it might take us to Chile, so, ya, a little bummed we didn’t get to go there, but I’ll get over it… somehow. Not sure why I’m posting this because I can’t really put into words what an amazing experience this was but I feel I need to at least try. Getting to the theatre and seeing so many wonderful peeps we hadn’t seen in three long years. Many hugs were had. The moments before David came out (we knew when that was thanks to same program). On the flight to SLC, Refnaf and I made a pact that we would leap to our feet as soon as David walked on stage for the first time. Extra pressure since we were sitting a couple of rows from the front so could have been awkward but NO, it was aMAZing, everyone ended up standing! And although he looked sheepish about it all, of course, we made him suffer through it by staying on our feet cheering. I tell myself he secretly enjoyed it. Seeing him standing there a grown man. Not a boy, man-child or unicorn princeling (well, actually he still is that), but a grown up. We’ve been fast-forwarded two years and BAM there he was. (In really nice new shoes, btw.) And fully grown up singing too… deep, rich lower register like a river of molten chocolate lava… self-assured, in control… no bouncing to Zero Gravity…. yet… but I have no doubt he’ll go wherever his music takes him. The First Noel. Hearing him sing live again was like being given water after three years in the desert. I can’t honestly remember anything but thinking how PERFECT it was and how grateful I felt. Yada yada yada. Lots of other really nice music but honestly, checking program for when David was next. Do You Hear What I Hear. Stunning, I just kept saying “WOW! WOW! WOW!” over and over again. It was like being a fly on a wall during a jam session, watching them improv a little and work out the arrangement on the fly. Seeing David be more comfortable not singing through the whole thing but letting it flow and coming in when it felt right and doing some cool jazzy things with his voice that there’s a technical name for but I can’t for the life of me remember what that is. This is my new “This Christmas” and “O Ven,” destined to be on repeat on my iPod for a looooooooong while. Glorious. ‘Twas glorious. David gave a little intro and FINALLY we got to hear him say something. Didn’t realize how much I’d missed that (here in the No-Vlog Era) until he did start talking. Silent Night. Like hearing it for the first time. Some other talented people … musicians and choirs and dancers and an aerial artiste that Princess Archie dubbed “Kenny G” (uncanny resemblance), oh, and a wardrobe malfunction (not David’s), made for a very entertaining show. But yes, checking program again for you know who. Again with the pact, and Refnaf and I got up as soon as he came out, along with everyone else, and he looked more happy about it this time, lol. Do You Hear What I Hear took on new twists and turns. Still the highlight for me. Glorious had no intro this time and maybe I was imaging things but David seemed a little perturbed about either that or something else. Just something different about his demeanor, but he still sounded incredible… of course. Everything else was a beautiful blur. Props to the incredible musicianship of Kevin Olusola (even though I still can’t pronounce his name). 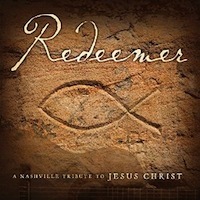 And I loved the SLC Mass Choir so much I bought their CD, REALLY good! Last. Show. 😦 This time when we all stood up he seemed resigned to having to bask in the love (victory!!! )In fact at each show he seemed more and more relaxed and open to looking out to see who was there and having fun and enjoying himself. Was great to watch that unfold. DYHWIH. SOOOOO incredible I literally jumped up at the end and didn’t care if anyone else joined but of course everyone jumped up. Because. David. I had been hoping he’d hold the big note at the end and he did and it was magnificent and every single thing about that performance was magic and they need to release it on itunes and let it take over the world. The End. Amazingly he seemed to enjoy the Standing O this time (probably because he pretended it was for the other 2 musicians), he was literally beaming. And he had that special smile he gets when he knows he nailed it. BECAUSE HE DID!!!!!!! Watching the way he did that helped put things in perspective for me. He seems happiest when we’re at a safe distance, lol. In fact, as a fan, sometimes I feel like a stray dog who’s followed him home and he’s appreciative of the loyalty and may even throw over a bone out of kindness but ultimately wants to wave goodbye, go home, shut the door and do his own thing. I’m good with that. Just call me Spot. Sorry if this blog is nuts, I am out of practice, lol… and a HUUUUUUUGE thank you to everyone who took videos. You guys ROCK!!!!!! MERRY CHRISTMAS & HAPPY HOLIDAYS, EVERYONE!!! Day 2 on set of this #ShareTheGift shoot with @davidarchie and my receding hair line. 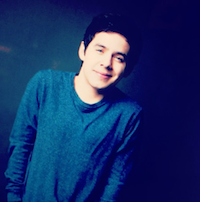 This entry was posted in Concert recap and tagged David Archuleta, I'm still toast, Interfaith Concert, Kevin Olusola. Bookmark the permalink. Thanks from the bottom of my heart for writing this great recap for all of us ODD fans that couldn’t go. I love to hear that David the fabulous singer is back! 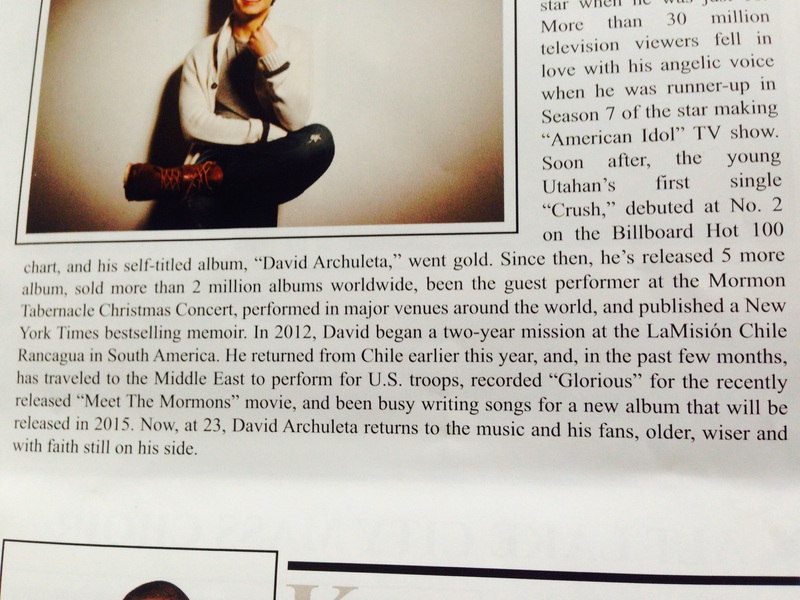 Plus it’s wonderful that right in the program it states that David is putting out new music in 2015. Can’t wait! This weekend I got to know one of the kindest souls I've ever met in the music industry. His talent matches the big heart he has. And he's got such a pretty voice lol. 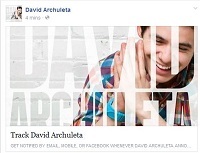 @DavidArchie, a pleasure collaborating with you! Lots more to come! Deb, you are wonderful! You captured the events just perfectly. It was great spending time with you. Love ya! Sooooooooo wish you could’ve been there, Rox!!! ❤️❤️❤️💔 thanks for this and your awesome bestest recap. I want credit as the first one to yell “ENCORE”!!! I was wild and crazy, baby! It didn’t work but I think he was considering it for half a second. It was so good to see you guys and DAVID in the flesh. He sounded great, looked great, was great. Lovely day, lovely day, lovely day, lovelllly daaaay. Oh, lol! I didn’t mean you had to give me real credit in your article! Heeee. You’re very nice. Ahhhhhh!!!! So glad you two went!!!!! Thank you! Thank you! This is epic recap!!!! I love living vicariously through you guys!! Thanks! Very happy you got to go and experience the awesomeness of David back on stage! Happy to see this new post from you — thank you for sharing the events of the last few days! Crazy good!!! Coincidence? Serendipity? TOfan – hubby and I were so lucky to be able to go to SLC… but to meet up with you and RefNaf – well it was icing on the cake! We talked to many fans outside of our ‘super fan minority’ who were – if not quite as passionate as we are – an enthusiastic friendly bunch (and there were a LOT of them)! Do You Hear What I Hear – never before had I heard such an arrangement of this song – Jazz inflections TOfan, could well be – to me it was ‘ethereal’. Quite stunning. Yes, should def be in the ITunes library. This brings me to Kevin Olusola – U (vowel sound as in boot) – so – la. I have always be intriguingly mystified with his beat-boxing (acapella group Penatonix) capabilities – how DOES one make all those sounds with your voice alone? – but, his cello skills are incomparable. A truly mesmerizing result of artistic collaboration on this song. 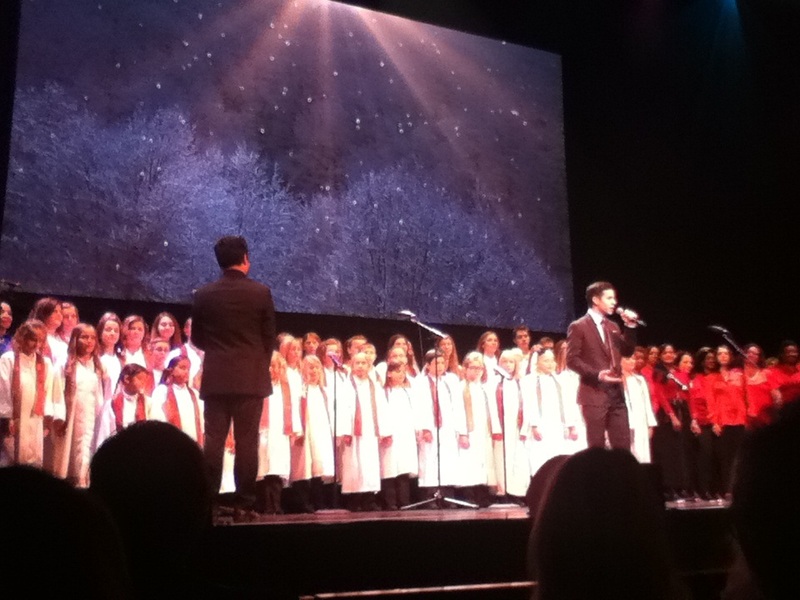 Believe – from The Polar Express – also the first time I had heard this song – was joyously sung by David with a huge compliment of ‘choir’ behind him. His voice continues to be one that stands out, rises above and quite literally melts my bones. TOfan, does Spot have a friend? I so very much agree with your last 3 paragraphs – before the ps. I literally had to re-start my computer – when I got to the video entitled ‘And this one (complete with Pie Monologue) from the lovely Shelley’. I was laughing so hard remembering the happy, at ease, no sign of discomfort, pie monologue by David that when I clicked on the vid to watch it – it Froze up! Gosh ((((((TOfan)))))) You manage to recap everything with such grace AND humour!!! This trip was a mountain top experience for me…. SO WORTH IT!!! I will never hesitate to go see him whenever, wherever, and however I am able! I need to thank all the peeps who take pics and vids! You guys are a blessing to the fandom! ((((hug)))) Another thing I am not able to do!!!!! ((((hugs)))) all around! David is the best!!!! Yikes!!! Also thank you Abrra For the mp3’s ! You are an angel!! Yup ditto – bows down to ABBRA! Aww, what wonderful memories this post evokes. So happy you were there to share it with us. Hope everyone has a very happy holiday season! Dang!!! I missed you guys!!!! BUT. I didn’t miss David. Witnessed him and his perfection (even a couple of goof-ups, but that just means he’s real). Yes, this was too good to be believable… pinched myself a couple of times. Did your heart just jump when he walked out that first time? To actually be seeing him in the flesh?! Wow! Let’s ring in 2015 ASAP!!!!! Wonderful, fabulous post TOfan. So glad that you (and Refnaf, Awestruck and others) were able to go to the concert! A nice detour on the way to go fishing, ha. Such a terrific recap and description of your experiences. What a beautiful concert, so grateful for all videos, pics that fans took. Just from the videos, David sounds incredible. Love the songs he performed and yes….DYHWIH is simply stunning. Loved them all, incredibly good. I was familiar with Believe as JG sang and recorded it very nicely and had had the thought that David would sing this very nicely too….and he did. Fantastic with the choirs. Your description gives us a glimpse of the wonderful live experience after so long. Thankful too, to Abbra for the MP3s, so nice. I had held the thought all along that I would love to be at David’s first concert. However, with this one it just wasn’t to be, timing was off as well as other things. Oh well, so very happy for all that made the trip and experienced the return of marvelous Mr Archuleta on stage, in all his glory. Oh….and there will be a DVD and CD made available from the concert, wonderful! Welcome back, TOfan! Loved this post! Thanks for taking us all along for the ride! *wiping some sort of unexpected moisture out of my eyes* Oh Deb, I miss you when you’re not here. Nobody captures it like you do. Brava to you and Refnaf for starting the standing-O’s of the series. So many wonderful people at the concert. I wish…ah well, flakes over the snowbank. One day, one day! Oh Deb, I still have a little afterglow from the concert, you know what I mean?. It is still so real and I don’t want to let it fade. Thanks for your recap, I enjoyed every word. When you described how when he first came out and was standing there right in front of us and then sang, “The First Noel,” and likening it to being given water after three years in the desert, I totally know what you mean. Saturday night he was perfection. DYHWIH!!! Yes, It should be recorded and played on every Christmas radio station around the world. And Yes, he did have that little special smile at the end. He knew he nailed it. He nailed every song that night and got a well deserved, standing ovation, for each one. That had to feel good. Deb, it was great to see you and Nancy again, and so many wonderful friends, and get to talk, and laugh, (and gush a little.) Lets do it again soon! I love you guys. David has brought so many blessings to my life. 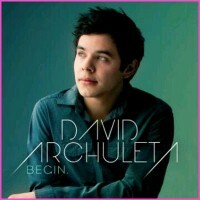 “And tears came to my eyes because David was back, and right there, and singing his heart again. And you just don’t want it to end…” <= THIS!!! *sniff* 'Twas so great to see you guys, too, def. icing on a wonderful cake!!! That little ninja’s at it again! Anyone know who this Peter Hollens guy is???? Oh Canadians what have you done? Well seriously I am so pleased that you stood for David exactly when you did. That was longtime fans at their best. I have watched the videos carefully looking at his eyes as he scanned the audience. I was thinking that when he saw those he knows who came from great distances he would have been amazed. All of you left him with reassuring thoughts. 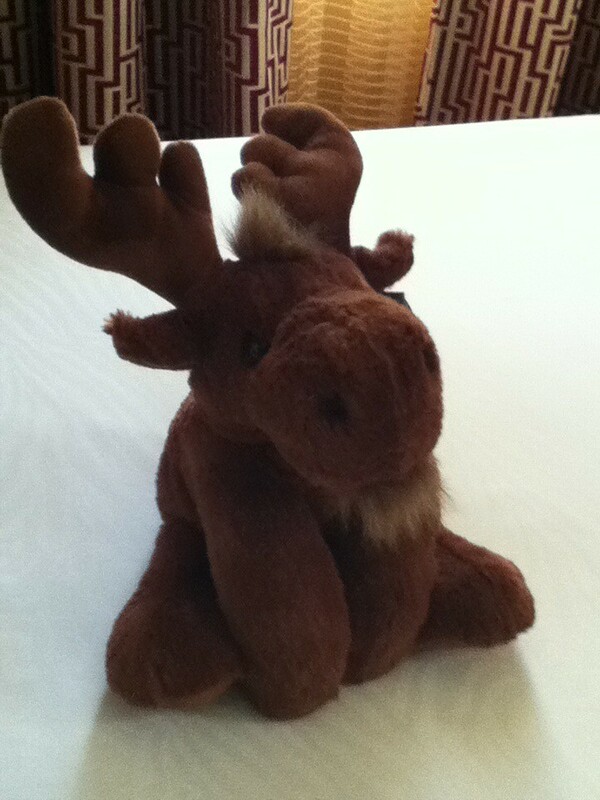 Really, a moose on your bed? I remember my first trip to hear David. My pact with myself was to go wherever David first sang with a choir and orchestra. So that was Abravenal Hall a few years ago. I remember Refnaf saying she wouldn’t miss anymore big concerts! It was so good to hear your story! I will be there too as what you have said is most important to so many. An excellent quote. I’m late to say so, but I love this SnowAngelized recap! I confess to some lingering sadness for not being in SLC with y’all. 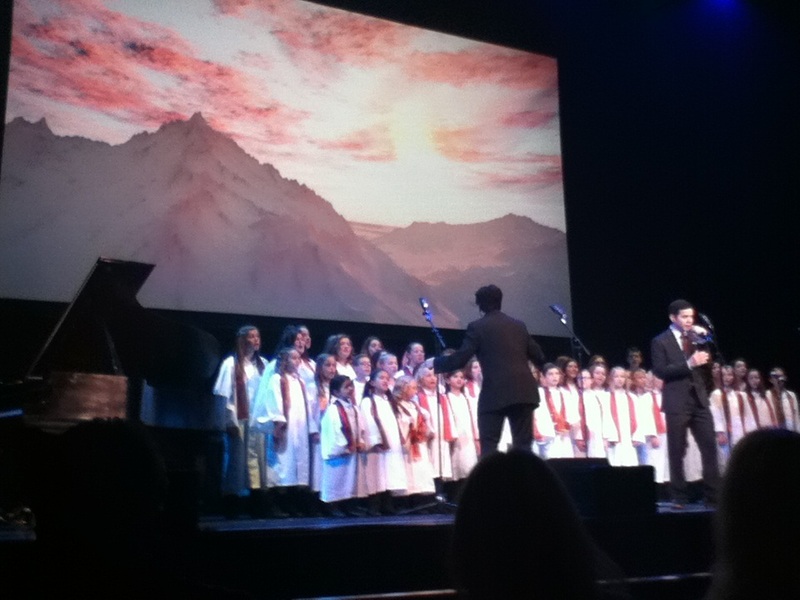 David’s concerts are always filled with goodness and glomping. Who would not be sad to miss that? Thank goodness for the concert videos and online spazzing—enjoyed every comment here. Yep, he got that right. WoW! TOfan!! I love this video!!! It’s good to see the other musicians along with David. And, the sound really is very good! Thank you for sharing it!!! I love your video too TOfan, the sound is wonderful and the ‘fans eye” view is rather special You can take it all in…like a magical, musical creation up there on stage. Sooo..nice! Thanks, Tawna & Pepp, I only really took it for myself then thought, hey, might as well post it…. Other little moments keep coming back to me about the show… David artfully pausing after he mentioned his mission to give us a chance to applaud, lol … “snow” falling during the Believe finale and then David smiling his crinkly-eyed smile as he watched the littlest kids in the choir collect it in their hands like it was real… David’s fancy new shoes… the way he motioned the conductor to wait a sec so he could do an intro to Silent Night. watch at your own risk, David’s in it but it is truly painful. Wish David would have jumped on the trampoline with them and sung Zero Gravity lol! Here’s a behind the scene video of the Largest Nativity taping made by Pete Hollen’s wife. You can see David a few times but the Hollen’s baby is featured and is the cutest! He even plays baby Jesus. It didn’t hurt me any to listen to that again, lol! You know what I’m thinking we’re needing? A behind-the-scenes (not really) for either the Nativity thing or the Interfaith concert. Though they may have all been one long event in the mind of the Ramblin’ Man….